Click here for Editorial Calendar in pdf format. MECHANICAL INFORMATION: Issued 9 times a year. Web offset printed on glossy coated stock. Type pages 7" wide x 10" deep. Trim size - 8-1/8" x 10-7/8". Gutter width 3/8" each side. Two or Three-column format. Columns are 2-1/4" wide (3 column format) by 10" deep. Columns are 3-3/8" wide (2 column format) by 10" deep. Issued six times yearly. Published first week of month. Advertising space reservations close 15th day of second month prior to publication. • CDs, DVDs and other media are accepted. E-mailed files under 5mb accepted: e-mail to janet@productionebm.com. To upload files to the On-Campus & Hospitality FTP site, contact production director. 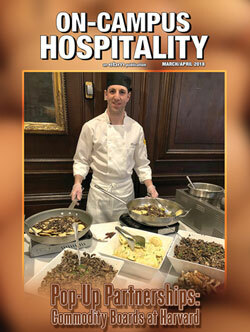 Contracts and insertion orders should be sent to On-Campus Hospitality, 825 Old Country Road, Westbury, NY 11590-0812. Copy, artwork, and other printing material (except inserts) should be sent to the attention of the Production Department. $40 per year. Single issues, $7.00 plus postage.